Up a winding, tree-lined street away from the constant chaos of India's financial capital lies the construction site for what is believed to be the most expensive home in the world.The house -- more like a tower, really -- is estimated to cost $1 billion, and its future resident, Mukesh Ambani, is India's richest man.As designed by Chicago architecture firm Perkins + Will, the in-progress glass-tower is estimated at $1 billion and is known to feature, at the least, a health club, multiple "safe" rooms, 3 helipads, 168 parking spaces and require 600 servants to maintain, and physically, the structure stands at 27 stories, or 570 feet tall. 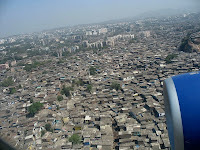 Dharavi, in India's commercial capital Bombay (Mumbai), is Asia's largest slum. Made up of ramshackle corrugated tin sheds it is home to almost a million people. It is 500 acres in length and is estimated to be the most densely populated area on earth.But it is a unique shanty town.Thanks to a thriving crafts industry, Dharavi generates business worth nearly $1bn a year. Local workshops turn out leather goods, pottery, and jewellery, much of it destined for shop shelves in the West. As India progresses into the 21st century the growing divide between the rich and the poor grows wider!